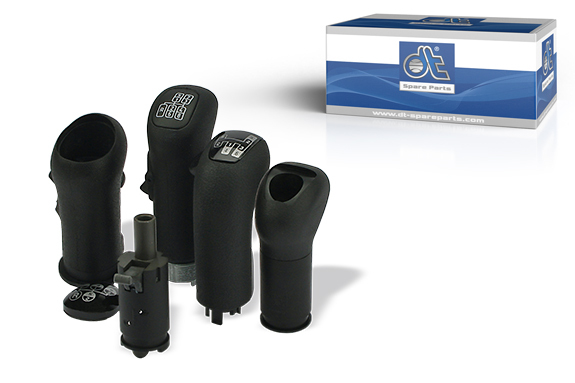 DT® brand gear shift knobs work pneumatically or electrically depending on the design. The pneumatic gear shift knobs are provided with durable compressed air sleeves which are suitable for polyamide pipes according to DIN 74324 with a diameter of 4 mm. Electronic Power Shift (EPS) is a semi-automatic gear control which optimally implements the driver’s gear selection with the help of a pneumatic controller in the gearbox. Instead of a conventional shift lever with H-gear shift, a joystick-type touch switch is available to the driver. After each change, the gear shift knob jumps back into the original position. Depending on the model, both a splitter transmission (primary transmission) and range transmission (secondary transmission) can be shifted with the electro-pneumatic DT® brand gear shift knobs. *With the split transmission (also known as primary transmission), an additional countershaft transmission is attached to the intake shaft. This allows each gear to be driven through in two stages, either with high or low gear reduction. **The range transmission (also known as secondary transmission) is a two-stage planetary gearbox which is installed between the basis gearbox and the drive shaft. Due to the two-stage gearbox, the number of gear shifts is doubled.